Dump your doorstops – it’s time to upgrade… | Hey Bernice! Recently I have become obsessed with doorstops. Maybe because I have had to rely on them a bit lately. I have found myself (as I did with my red cooking utensils) collecting heavy antique items to use as doorstops. Lucky for my husband there is a limit to how many of these I can collect (unless we sell our house and buy one with more doors!). However, if he does complain about this too much – many of them would make very effective weapons. I’m not saying that the good old rubber doorstop doesn’t do the trick – they are great (but you have to agree they are ugly!). I then added the Cobbler’s Tool (a logical progression…!!!) and bought an antique cast iron cobbler’s Leather Working Tool or Anvil called a Shoe Last by some. This is very heavy (the first requirement of a Doorstop! ), however keep the Band Aids handy with this one as it tends to protrude from the door further than most, and could catch a little toe on the way through – WARNING: keep away from thoroughfares. 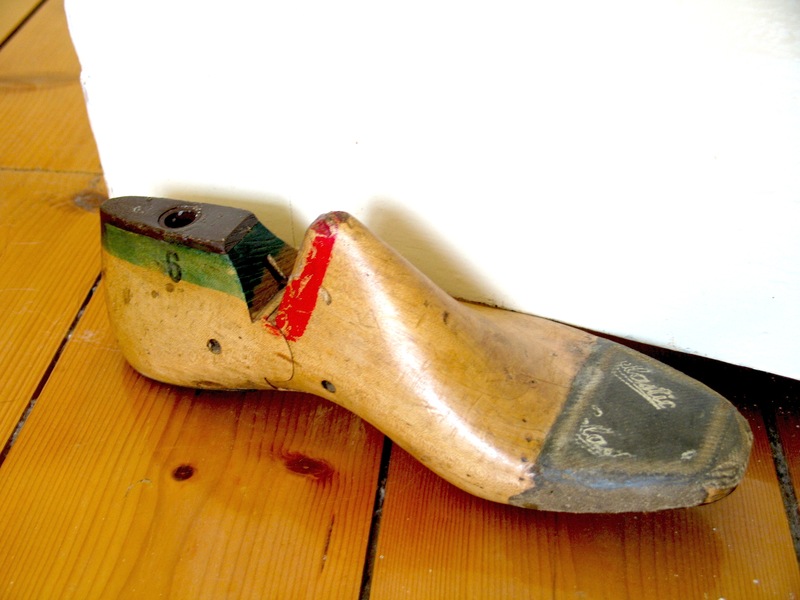 The most recent addition is my purchase last week – a pair of antique wooden shoe forms. They are not particularly heavy, but are perfect for internal doors, especially those that have a fondness for closing themselves, and need a permanent door stop against them. Obviously anything with weight is a contender for a doorstop (just watch the size, some doors have the space for something bigger), my brother has an old copper divers tank that would look great as a doorstop as well. There is a recent trend where shops are selling printed material (pyramid shaped) sand-bags with a handle – that look lovely. However for the same investment you can buy a piece of history to keep your doors where you want them. It’s up to you what you use – just enter an antique store and open your mind to the possibilities!